Mali's Sahel and Sahara regions house many species of cobras, adder, vipers, and lizards. 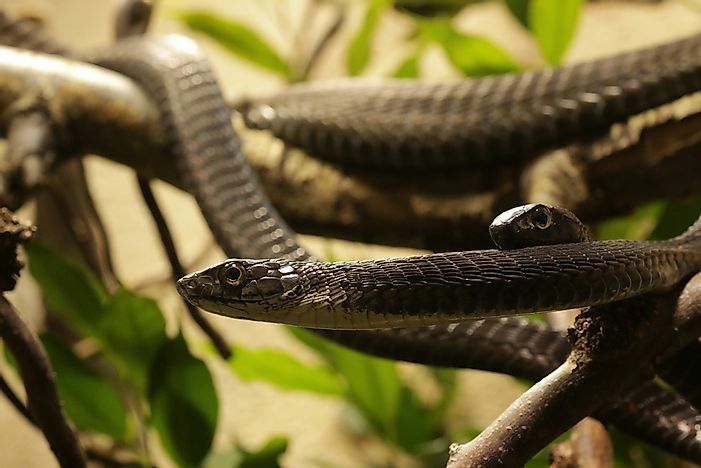 Boomslang snakes are highly venomous and can be found in Mali. The Saharan desert covers 33% of Mali and determines the composition of country’s flora and fauna. The protected areas include two national parks, six faunal reserves, two sanctuaries (one of which one is a designated UNESCO World Heritage Site), and a biosphere reserve. Mali has a large population of mammals and reptiles with several birds and amphibians. The reptiles inhabit rivers with the largest population found in the Niger River Valley. Mali is also home to some of the deadliest snake species in the region. Puff adder is a venomous species of viper found in the Savannah and grassland throughout Africa. Its wide distribution in Africa has led to the most snake bite fatalities in the region. Puff adder is a very aggressive snake which often frequents highly populated regions. The belly is yellow or dark brown. Puff adder relies on camouflaging for protection while its locomotion is primarily rectilinear. It moves with speed if agitated and can also swim and climb with ease. It hisses loudly and coils in an “S” shape to assume a defensive position if disturbed. It is mainly nocturnal and preys on reptiles, mammals, and amphibians. Desert horned viper is native to the deserts of North Africa. This venomous viper species is easily recognized by the by the presence of a pair of horns. An adult desert horned viper measures 30 to 60 centimeters in length with the female larger than the males. Its prominent eyes are set on the side of the head with the male having larger head and eyes than the male. The color varies from yellowish to pale brown. The dorsal has series of dark blotches which run the length of the body. Desert horned viper favors dry, sandy areas with rock outcropping. It can also be found in oases. Desert Horned Viper moves by sidewinding pressing their body on the sand. If threatened it assumes a “C” shape and rapidly rub its coil together. It hunts by rapidly striking and holding on to its prey which includes birds and rodents until the venom takes effect. Boomslang is a large venomous snake belonging to the family Colubridae. Its name translates to “tree snake” in Afrikaans. Its eyes are exceptionally large with excellent eyesight while the egg is oval-shaped. The male Boomslang is light green with black scale edges. A female snake lies over 30 eggs which are deposited in hollow trees which are incubated for three months. Its diet includes chameleons and lizards. Boomslang has highly potent venom which can kill a human being within minutes. The native reptiles of Mali are listed as Least Concern by the UICN because of their wide distribution. Most of the reptiles, especially the snakes are very aggressive and venomous hence are not easily hunted making their conservation very easy. Some of the reptiles like puff adder can be raised in captivity as a conservation measure. During droughts and extreme famine, the reptiles may find their ways to homes and settlements to look for food. During these times they cause most snakebites fatalities.